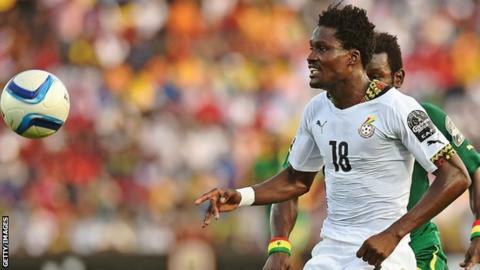 Leicester City are set to sign Ghana international Daniel Amartey, the player's Danish club FC Copenhagen say. BBC Radio Leicester are reporting the transfer fee could be between £5m and £6m. Amartey, 21, can play in defence or midfield and would join a Foxes team who are second in the Premier League, level on points with leaders Arsenal. A statement from FC Copenhagen said only a "few minor details" remained to be finalised. Amartey, who has won six international caps, has played 63 games for FC Copenhagen since joining them in 2014. "Daniel has been a role model and a key player for us, and he has improved dramatically and faster than anyone could have expected," FC Copenhagen manager Stale Solbakken said. "He has handled his success and all the attention extremely well, and it is a dream come true for him to play in the Premier League for a club who have targeted him for a longer period. "We wish Daniel all the best in the Premier League and we are sure he will have a great career." Leicester manager Claudio Ranieri declined to offer his thoughts on the proposed transfer during a news conference ahead of Wednesday's FA Cup third-round replay against Tottenham. "You know I speak only when some new players come," he said. "Until that, I'm sorry - wait a little more. "I want good players to improve my squad. Amartey is one of these, but I don't know. I wait." Amartey would be Leicester's second signing in the January transfer window, after winger Demarai Gray moved from Birmingham City in a transfer worth £3.7m.